I'm Angela, and my mother is a Joplin tornado survivor. While I was very fortunate that no one in my family was injured in the storm, my mother's home on Ozark Avenue sustained extensive damage, and I spent many months helping her get back on her feet. Although I now live in Broken Arrow, Oklahoma, I grew up in Joplin and will always consider it my hometown. It has been devastating to see the destruction to my childhood home, church, high school, and many other places I held dear. My heart aches for all the families who have lost loved ones and for the numerous individuals who have suffered serious injuries. It will be a long road to recovery for the people of Joplin, but I have faith that the city will emerge from this tragedy. During the months after the storm, I realized that all disaster survivors need a way to memorialize the things they've lost. To meet this need, I opened Cedar House Keepsakes, an online shop featuring a collection of items produced by artists and craftspeople from across the country. Our purpose is to create personalized keepsakes that pay tribute to what disaster survivors have lost, and we're passionate about our cause. We offer keepsakes for every budget, with a number of items priced at $35 or less. There's truly something for everyone, and many items will make heartfelt gifts for friends and family members affected by the disaster. I'd like to express my deepest condolences for any losses you've suffered. Preserving our memories is important, and I believe it is a crucial part of the healing process for disaster survivors. We're looking forward to helping you honor your past with an eye toward your future. Never is community spirit stronger than after a catastrophe. You can show your support with a customized "Hometown Pride" art print. Specially commissioned jewelry and gifts are also available. Whether your house was big or small, new or old, it was yours. 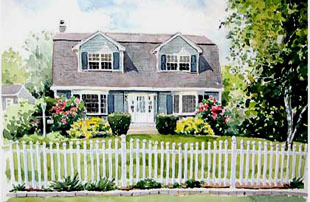 We offer a collection of items to serve as keepsakes of your home, including watercolor paintings and address plaques. Our hearts go out to all those who have lost loved ones in a disaster. We offer a selection of keepsakes to honor your loved one, including memorial jewelry, painted garden stones, and memory quilts. Whether your pet was killed in the disaster or simply disappeared in the chaos, your grief is the same. We offer a number of items to help you remember your pet, including handmade memory quilts, pet portraits, and photo blocks. When disaster strikes, we're instantly reminded of what's really important. We offer a selection of items that celebrate the things we cherish, and it's our hope that they will bring you comfort as you rebuild your life. While our collection includes a number of items priced at $35 or less, we understand that funds are limited for many disaster survivors. For free tips on creating your own inexpensive keepsakes, click here.